All blow molded, and injection molded plastic products are formed with molds that are called tools. These tools are both molds and machines that are manipulated by larger machinery to form each specific part or product. The tools must come apart to release each completed product, injector pins may be necessary to push each part out of the tool, and other moving parts can also be necessary. Just like a car wears out and needs maintenance, tools are the same. All tools have a finite number of units they can produce, just as each car can drive lonely so many miles without maintenance or parts replacement. Like a car, certain repairs don’t make economic sense before replacement is the next option to keep production going. Here we discuss four reasons your tool may need replacement or a major overhaul. Bad parts. Many parts must have very narrow specifications to fit with other parts, from bottle caps to bottles to more sophisticated applications like clock parts, semiconductor parts that fit on board, or medical applications. When the parts no longer fit each other, its clear that the tool cavities have worn enough to create sloppy specifications. When this gets to the point where the parts affect the final product the choice is clear. The tool needs to be repaired or replaced. Flash from the molding process is increasing the cost of removal cleanup. Flash is the extra plastic material that seeps into the slight gaps between molding parts. It can also get worse as the edges of the mold wear creating slightly wider gaps. Certain types of wear can be mitigated, which will increase the overall tool life. Repairs would be required. Material composition. Certain types of resin wear out the tools faster than others. This difference can be quite dramatic. Very viscus resin may allow hundreds of thousands parts to be produced in spec, while others will wear out in a few tens of thousands of units. Some material calls for fiber glass and lubrication embedded in the final product for strength or other mechanical purpose. The lubrication and glass together create a very abrasive condition. While the plastic goes into the mold highly viscus, when hardened it can be more like sand paper than a smooth plastic like surface. Some materials can be corrosive and react with moisture and heat attacking the mold over time. High pressure and temperature. Metal can slowly erode the tool material and the geometry shape can grow out of spec. In some operations rapidly cooled and heated metal can crack the surface. The material the tool is made from is also an influence. Aluminum is softer and therefore will wear faster than steel. Materials include steel, aluminum, stainless steel or aluminum alloy plated. A multi-cavity mold as a more complex tool can require more maintenance. A preventative maintenance program can be developed to extend tool life. 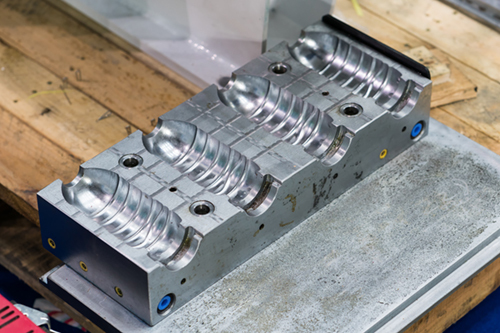 This extends the working life of injection molds. This can decrease the overall production costs for the lifetime of the tool. Maintenance can also curtail flawed components. Tool use, design and maintenance is generally a technical discussion. This is a service Microdyne provides to customers. If you have a project with tooling challenges, share to with us in the Quote Request form below.